This is an intriguing, fast-growing groundcover with lovely eye-catching white flowers that provides a carpet-like look upon first entering your yard or garden. 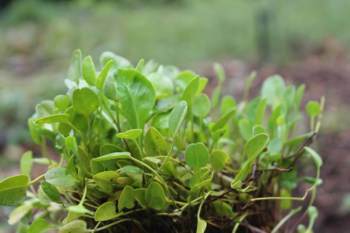 Falkia repens or oortjies (meaning little ears) is a fast-growing, creeping mat-like perennial herb that works well as a groundcover or when combined with other plants. It can grow in sun or shade and looks great when filling in between rocks or when cascading down a container. 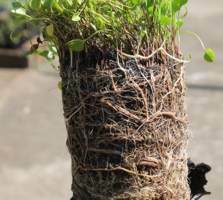 Stems (±25mm) are firm and slender and root at the nodes with the plants reaching a height of 50-100mm. Leaves are variously shaped but generally broadly ovate with rounded tips and bases, ±6-25mm in diameter, slightly succulent, green to yellowish, shiny and mat-forming. Flowers are salverform (trumpet-shaped), solitary (±15mm diameter), white or pink, and flowering time is from late September to December. Fruits are known as schizocarps, dry dehischent fruit that split into two or more separate carpels at maturity. Fruits are buried in the soil by the downward bending of peduncles after flowering; the persistent calyx encloses the ripe fruit, acting as a protective structure. This is known as geocarpy (development of fruits in the ground from flowers that were pollinated above-ground). Falkia repens is endemic to winter-rainfall areas in the Eastern Cape, often on damp or temporarily inundated soil. Falkia repens is nationally Red Listed as Least Concern (LCe). Falkia repens is endemic to the Eastern Cape and Western Cape of South Africa. The leaves of Falkia repens resemble those of Dichondria micrantha but the species are easily distinguished when flowering. This falkia can tolerate heat, drought and poor soil, despite its delicate appearance. Falkia was named by Thunberg, in honour of John Peter Falck (also known as Joannis Petri Falk) an 18th century Swedish professor of botany at St Petersburg. The species name repens means 'creeping', alluding to its habit. Falkia repens is pollinated by moths and bees. Falkia repens is a reliable groundcover with leaves that are slightly succulent, enabling to withstand high temperatures through conserving water its leaves. It can be used to make a herbal infusion. Falkia repens is an extravagant plant that makes a beautiful feature during winter. It can be a substitute for grass, requires regular, moderate watering and prefers fertile, humus-rich and well-drained soil. If you have an open area/space that requires filling in fast F.repens is the best groundcover to use especially because it grows very fast and can tolerate most harsh conditions. Falkia is propagated from rooted runners; divide sections of the plant with its roots. New plantings should be watered daily for a couple of weeks and the spacing between plants should be 300-460mm, as they spread fast. Snip off individual plants or wait until the flowering season is over and remove the whole flower stalk to the base of the plant. This keeps the plant's energy focused on vigorous growth instead of seed production. Cut back hard any time it starts to turn brown. By dividing the plant over time, you encouraging its shape. Dig up and divide plants every 3-4 years to stimulate healthy new growth. Falkia repens grows well in a mixture of loam and peat or any other light soil and thrives in full sun to partly shaded areas. Falkia repens requires feeding in Spring with organic 2:3:2 or 3:1:5 fertilisers for lush growth. To give the plant an extra boost, add a granulated starter fertiliser or all-purpose feed that encourages blooming e.g. 5:10:5. Companion plants that work well with F. repens are ornamental grasses, Achillea species and Adenium obesum (desert rose). African morning glory, creeping falkia (online).2014. Available.http://www.mygardenlife.ca/plant-library/4982/falkia/repens (Accessed 5 May 2014). Foden, W. & Potter, L. 2005. Red List of South African Plants: http://redlist.sanbi.org (Accessed 14 April 2014). JSTOR global plants: http://plants.jstor.org (Accessed 17 April 2014). Newplant Nursery: www.newplant.co.za/product/falkia-repens (Accessed 14 April 2014). Siyakula Nursery: www.siyakulanursery.co.za/p/339464/falkia-repens (Accessed 17 April 2014). Pooley, E. 1998. A field guide to wildflowers of KwaZulu-Natal and the Eastern Region. Natal Flora Publications Trust, Durban.